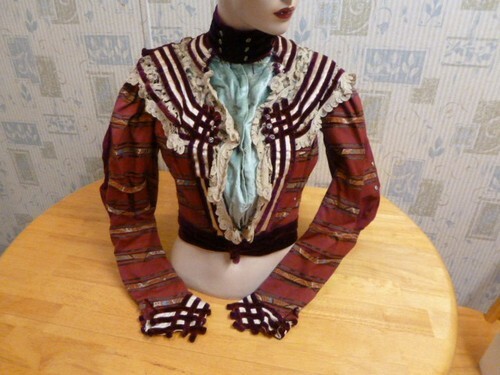 This is an amazing blouse!! The condition also wonderful. 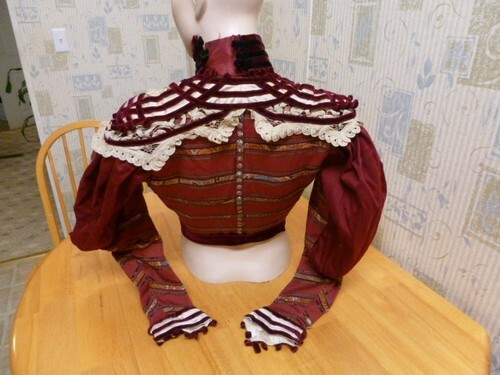 It has a high neck with a collar, collar has metal and Marcasite buttons, the collar is a burgundy velvet with black velvet ribbons. 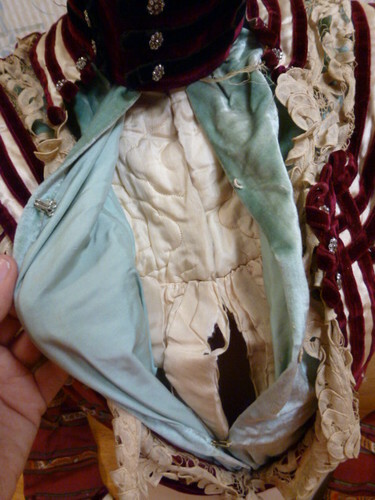 It is not fastened in picture because it would not fit all way around mannequins neck. Collar has hooks for closure also the first under layer is a very frail material and has some tufting. 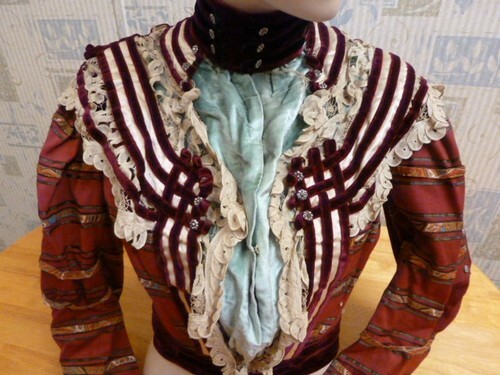 It feels papery I think it is silk it hooks together then overtopping that is a velvety silk layer that also hooks over.Overtopping that is a beautiful old lace , then there is a silk piece with burgundy velvet ribbons and more Marcasite buttons on each side. Then a very thick unusual fabric I do not know what it is but it is a brick red color and has a wild looking ribbon of fabric that runs through it, and then a green type pinstripe fabric through it as well.The lace and the burgundy velvet ribbons go down front and all way around shoulders to back.The sleeves have alot of fabric at shoulders and can be stuffed to make very puffy. Sleeves have the same fabric and a solid fabric in a pattern in the same color. Also with Marcasite buttons. The burgundy velvet ribbons crisscross cross on pointed sleeves and they hook together at bottoms. Bottom of sleeves at point also have an off white silk material. The back has Marcasite buttons all way down. There is a thick burgundy velvet belt that hooks around to the front at the very bottom of the top. 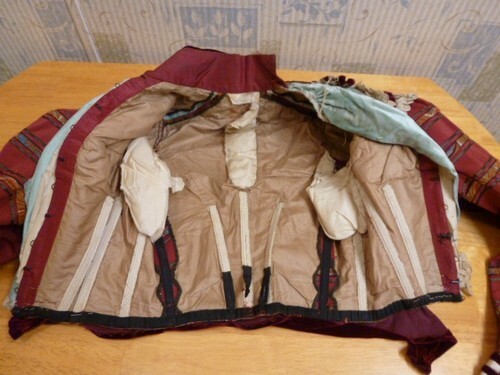 The inside has a brown paper tissue type material for a lining with 3 padded pieces one under each arm inside and one at back. There are 13 boning pieces inside. There are a total of 47 marcasite buttons. 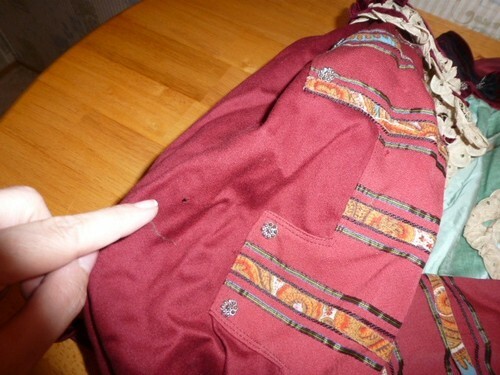 This top has only minimal damage as the fabric on the tufts on the inside lining has torn apart some. There is a tiny hole at sleeve where I have pointed to. Also the very inside piece that goes over has some tears from aging. I do not see any more damage as I try to list items description best as possible. This item is being sold as is and you can see on the mannequin it is in wonderful display condition as well as probably being in light wearable condition. I have more pictures I will be trying to post in the next few days. 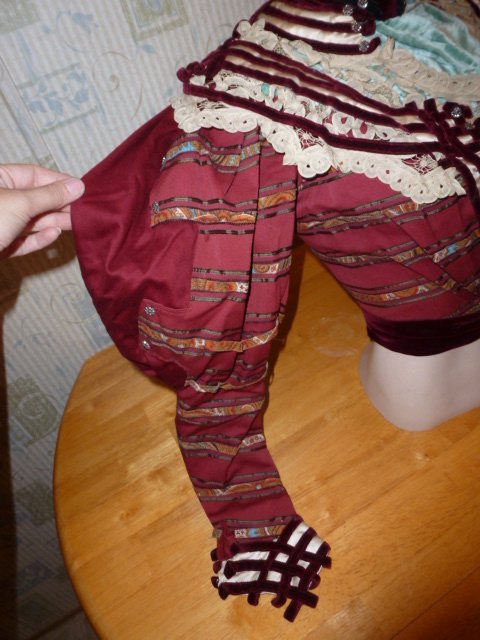 Top is a total of 18 inches long, 17 inches from armpit to armpit lying flat, waist is about 13 inches measured lying flat, sleeves from under armpit to hem is 20 inches long. Item will be sent insured. I ship within 7 business days.